Scarecrow has been painting his distinctive motorcycle art designs on new and used Gold Wings since 1980. The majority of his work is done at some of the largest Gold Wing dealers in the United States, but he has also been an annual vendor at Wing Ding, the national convention for the GWRRA, since 1984. This is the Millennium Eagle, designed for the 2000 Gold Wing. Each one is numbered, 1 to 25. 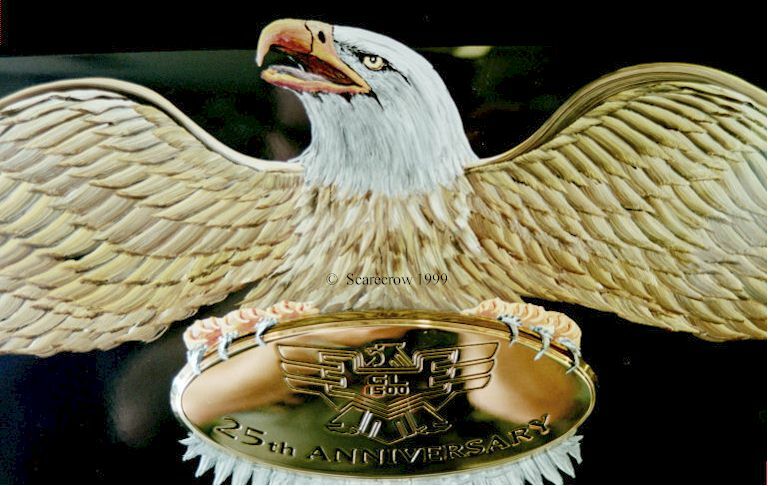 The eagle's claws wrap over the 25th anniversary emblem. This helps to give your eagle a real 3 dimensional look! You can click on one of these buttons to see more Gold Wing Photos. I have included additional photo pages for the GL1800. Click the GW 1800 button to see Gold Wing 1800s.